The terrorist group known as “ISIS” has been making headlines lately, however, very few are aware of the truth concerning this malignant organization- namely that it is nothing more than a false front and an organized program of destruction of the Gentile People. This article will set out to prove that “ISIS” is yet another lie with the purpose of turning the Gentiles of the Western World against the Gentiles of the East. Why (really) the use of the name of an Egyptian Goddess? “ISIS” supposedly stands for “Islamic State in Iraq and Syria”. At least this is the outward front they portray. On the other hand, there is a powerful subconscious link that the creators of this program are taking advantage of. As has been stated by many who can see through this front, WHY WOULD ARABS USE AN ENGLISH ACRONYM? Right off the bat it makes no sense, and this is the first alarm bell signaling that “ISIS” is not Arab in origin. The Israeli Secret Intelligence Service. The First letter of each word in the title, spells out ISIS, and this group has been known as ISIS for short since its conception. It is in fact the jews who have long been using the name Isis for their terrorist groups. Due to the powerful subconscious ties which we as Gentiles have to our original Pagan roots, it was impossible for the enemy to completely eradicate Paganism altogether. Thus, instead they stole everything, from our Spiritual Allegories to our sacred practices, Temples, the names and titles of our Gods, etc, before twisting them, corrupting them by replacing them with their jewish filth and then turning them against us as tools of enslavement. These ties which we still have also allow the enemy to tap into the subconscious of our Gentile People, drawing from this powerful energy and using it for themselves. They know just how to take advantage of this. Essentially, they have not only STOLEN everything from us, but then proceeded to use what they stole against us. This is common practice throughout the enemy programs of both christianity and islam. The use of the name ISIS, aside from being an acronym, is another example of this. As most people know, Isis is the name of a powerful Egyptian Goddess. Isis also goes by the names of Inanna, Ishtar, Ostara, Astarte, Aphrodite, Al-Uzza, ASTAROTH etc. Isis is an Ancient Goddess who goes back to the very beginnings of humanity, having been at our side since our birth. As a Goddess of fertility, motherhood, springtime, war, beauty, the divine feminine aspect of the Soul, sexual and romantic love and other very powerful aspects of our lives, the memory of her is imprinted deep within our subconscious. The enemy has used this name in order to tap into a great deal of powerful subconscious energy which they have been attempting to use against us. At the same time, it is a blasphemy and slap in the face to this Ancient Goddess. The fact that they have used this name for their “acronym” is no coincidence. What is the true purpose of “ISIS”? Everyone knows what “ISIS” says their purpose is- to establish an islamic state. (Please keep in mind that islam is merely another jewish program. See the above given links.) However, their true purpose runs far deeper than this and involves a great deal of playing both sides against the middle. How it ties into this article- they control both the “ISIS” terrorist group as well as the supposed opposition to it. The aim is to make it appear as though they are fighting against a foreign enemy terrorist to those who are otherwise ignorant. In all actuality, it is a giant illusion. There is no foreign enemy terrorist. There is only their false front which is merely a branch of themselves. What have they done? They have blamed the creation and actions of this terrorist group on GENTILE Arabs, turning the attention of the world away from themselves and onto another group. This is convenient for them as it stirs up hatred and anger amongst our Gentile People, instead of directing this hatred and anger against the real enemy. Whilst we fight amongst ourselves, they are free to carry on as they please. Their aim is to destroy us from within. Why get their hands dirty and kill us themselves when they can convince us to do the job for them? It is so much easier this way. They want us to do their dirty work by creating hatred and animosity amongst us. This will give them the perfect opportunity to move in to destroy us WITH OUR SUPPORT and with our soldiers blindly carrying it out. Their job is made easy. 90% of the Western World is screaming “fight the Arabs” because they have been duped into believing the terrorist attacks are Arab in origin, whilst the jews are then standing up and gleefully responding “well we will help you. Better yet, support us, join our army and we will go to war against them together and destroy them once and for all”. So, you have Gentiles routing for the destruction of fellow Gentiles while the jews laugh at their achievement. It is a sad state of affairs, to say the very least. There is another core purpose to the creation of “ISIS”. That is to gain support for israels war against the Gentile inhabitants of the Middle East, so they may take over the land with ease. They have long been invading Palestine and the Gaza strip, forcing our Eastern Gentile counterparts our of their homes and off of the land they have worked for centuries. Land which rightfully belongs to them as the original GENTILE inhabitants. It may or may not come as a shock to some that the founder of “ISIS” is in fact an israeli citizen, having jewish parents and ancestry and operating within the jewish “mossad”. Abu Bakr Al Baghdadi is in fact israeli citizen and undercover mossad agent Simon Elliot. There is literally a ton of proof for this if one does the necessary research, despite the fact that is has been vehemently suppressed in the mainstream media. *Note- the above given link supports the program of islam. In order to be fully aware and to completely break free of the trap in which the jews have placed you, you need to understand that islam itself is merely another jewish smoke screen. Yet another program of destruction for our Gentile People. Please read the entire contents of the exposing islam site. As well as Simon Elliot, there are a multitude of other “ISIS” agents and those involved in related jewish run terrorist groups whose real names prove they are of jewish descent. “Adam Gadahn” is in reality Adam Pearlman, a member of the ADL. His jewish descent has been well documented. Here is an excerpt from Wikipedia: “Gadahn’s jewish paternal grandfather, Carl Pearlman, was a prominent urologist; and on the Board of Directors of the Anti-Defamation League. According to Gadahn, his grandfather was a “zealous supporter” of israel.” There are many more examples like these. The video I am going to link below is very interesting in proving that “ISIS” is run by jews. Once again, this video contains corrupted information. Watch it carefully and use your judgment. There is far more evidence to support this if you do your research. So this begs the question, why are all of the leaders of a supposedly Arab terrorist group in fact jewish by blood? The answer is- this is not an Arab run terrorist organization at all- but a jewish illusion aimed at encouraging the destruction of the Gentile People. There is no doubting that it is the jews who are behind this operation, as they have been caught with their hand in the cookie jar. It is THEIR agents who created it, THEIR agents who run it, THEIR agents who promote the idea of it and THEIR agents who pretend to oppose it. It is all them from start to finish. This link also mentions how the ADL took control of the American neo-Nazi movements, running them into the ground. *Note- they speak of “converting from judaism to islam”. This, in all reality, is really impossible as judaism and islam are one and the same at the very core. Use your sense to see through the illusion!! 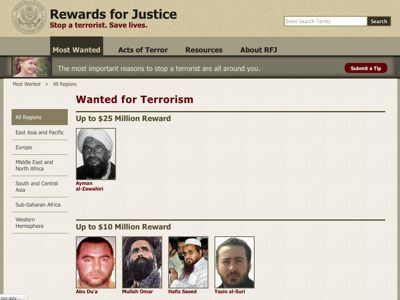 In closing, it is quite apparent that these terrorist organizations are smoke screens used to turn Gentiles against Gentiles and promote jewish supremacy. The following is a very informative article written by High Priest Mageson. It contains a great deal of information on the islamic state. Please read carefully. “Islamic State did largely come out of the Syria conflict and its this conflict that allowed them to rise to where they are now. The majority of the rebel groups fighting in Syria are proxies of Washington, Israel and the Saudi’s the trinity of Jewish power. The rebels are mainly foreign fighters and are trained in Jordan and moved across the boarder. Israel has been aiding the rebel proxy forces giving the camps, hospitals in the Golan Heights and arming them. As well as air strikes against Syria forces with their air force. Back in spring of 13 Israel used a small grade, tactical jewculur weapon on Damascus. As part of this effort. 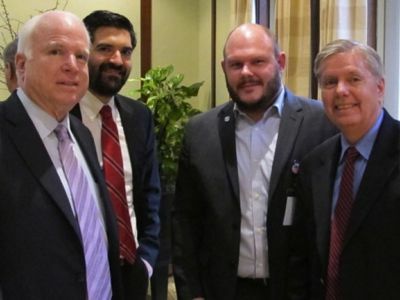 The jooz neocohen’s or neocon’s. Set a purposeful policy for Iraq that did everything possible to create a corrupt, backwards and weak new Iraq and push it into destabilized state. The polices had people pull their hair out in be wonderment. It was not incompetence it was purposeful. The plan for Iraq was its permanent dissolution as a Nation from the start. The Jews didn’t put all that effort into getting two wars against Iraq to rebuild it into a powerful nation that could turn on them. Of course they played a lot of trash talk about liberating Iraq and restricting and rebuilding it. Its all nonsense. Part of this was to put a Shia dominate, corrupt government into power that repressed the Sunni’s ever further. This was crucial to the current situation and Islamic State rise to power. This is also a Sunni liberation movement now. The national lines of Syria and Iraq are also artificial they where created by the British after taking the region from the Ottomans. They never cared to factor in tribal and ethnic regions. Iraq was always Sunni, Shia and Kurds and they never liked each other. So put in a decade of major destabilization, ethnic hostilities and meddling by the Jew controlled Western powers such as proxy wars in Syria and Libya. Its only a matter of time before something like Islamic State happened. Islamic State is taking on the major organized enemies of Israel in the Middle East. The Shia population. Assad is Shia so is his allies the Party of God in Lebanon that has defeated Israel twice and so is Tehran. Islamic State’s mission is to wipe out the entire Shia world. The Jews also want Baathism gone. Its the one ideology that was the realization for creating modern united Arab Nation States that are in the way of Israel. Syria is the last Baathist state left. Libya was also a modernized, progressive state. I read the Green Book of Gaddafi it was a well done book that outlined the social, economic and political paradigm of Libya. I wrote an article in the past on Libya and why the Jews destroyed it. Gaddafi was a good man and moral leader who risked his life to raise his people out of a literal darkage into a new society that was near utopian. He didn’t deserve to die the way he did. Thousands of his people died fighting for this Libya against the Jewish proxies who have destroyed the country and put it into barbarianism. Which is the plan for Syria. Islamic State also seems to benefit Israel by destroying Iraq and dividing it into a state where Sunni’s, Kurds and Shia will be in constant war. Baghdad was getting too close to Tehran anyway. Its my opinion Islamic State was as stated to be in the last phases of becoming a standing Army and creating a State that will stand. This will put the Middle East into decades of nonstop war within the Islamic world. Of course the Jews might want to help this out by funding and arms. It brings about what they wanted. Islamic State also gives them a propaganda without end and a excuse for further Western military intervention which is the new rhetoric coming out of Washington. Also think false flags like 911. They could pull another one and them blame Islamic State at anytime they want. So if Islamic State is not created by Israel it benefits Israel’s agenda. But it might be the bringing of the end. Its my musing that the situation in Iraq has pushed Baghdad into the arms of Tehran as they need their fellow Shia nation to defend south Iraq which is Shia from Islamic State. Tehran has already sent troops. If Islamic State gets powerful enough and Assad’s Syria is going down and this will result in massive ethnic cleansing of Shia and other non Sunni populations. And leave the Party of God alone between a radical Sunni Caliphate and the Sunni radical’s in Lebanon. Which is only a matter of time for them. And this would leave Tehran isolated and tip the balance of power they seem to need to kept Israel thus Western aggression in check against them. Which means Tehran would be finished. By a collection of the economic sanctions on them and constant warfare with Islamic State which would by this point by a large standing Army of fanatics with never ending Jihad on their mind. Who have sworn to conqueror Iran as well. Think of how bloody the Iraq-Iran war was. That war was Judeo West using Iraq as a proxy against Iran. What would another round with Islamic State be like. The previous war is still strong in the popular consciousness of Iranians. It was devastating. Perhaps looking at the possible end and near extinction event of the Shia world. Maybe Damascus, Tehran and the Party of God might just decide to unleash everything they have on Saudi Arabia and Israel the two major bases of the war against them in the Middle East. I believe the situation in the Middle East might have finally gone into point of no return. If this happens Israel will use its Sampson option as well maybe not just at Middle Eastern targets but as their leaders brag European targets as well. The Jews are already abandoning Europe on mass. Their already criminally insane leadership might view the end of Israel as the final end and decided to scorched earth policy on the hated Goyim in general. The big factor is the Abrahamic world all believe there has to be global war in this region to bring about the end of the world and the return of their god. The power of the collective unconscious of hundreds of millions of people the psychic energy of centuries poured into this and the amount of people tried into this program in the highest levels of control and international power might bring this into reality. 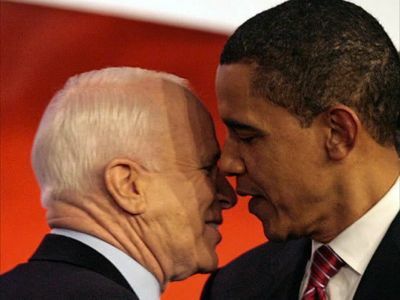 kbAre Barack Obama and John McCain political opponents as they claim, or are they working together on the imperialist strategy of their country? 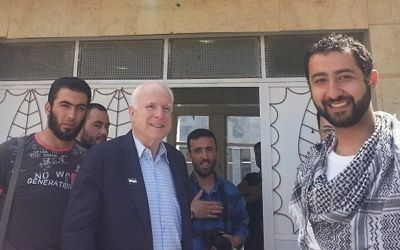 kbJohn McCain in Syria. In the foreground at right is the director of the Syrian Emergency Task Force. In the doorway, center, Mohammad Nour. That is a very great article. Its gonna take quite a large number of years for satanists to get into the top government positions and turn against israel. Please tell me, what are the ways in which you combat judaism except for the spiritual workings? In addition of spiritual workings, we can awake our fellow gentiles by posting links, distributing tracts, etc.